Foodborne illness (often called food poisoning) is a sickness that is caused by eating unsafe food. Foodborne illness can be mild, causing a stomach ache, or severe, causing a trip to the hospital or even death. The main causes of foodborne illness are bacteria, viruses, fungus, and chemicals that get into or grow in food. Who Should Watch Out For Foodborne Illness? Anyone can become sick from eating unsafe food, but some people are more likely to get ill. Children, older adults, pregnant women, and people with weak immune systems are more likely to get sick and should take extra precautions against foodborne illness. Sometimes when we think of food safety and food poisoning, we think of restaurants. But food poisoning can happen at home too! It is important to be aware of food hazards and practice food safety at home. There are three main types of health hazards that can be caused by not following food safety rules: biological, physical, and chemical hazards. Biological hazards are hazards that involve the growth of living things like fungus and bacteria in food. When these grow in food, they cause the person that eats the food to get sick. Physical hazards occur when physical objects are in food, like bones, glass, or fingernails. These can be swallowed and cause choking, cuts, chipped teeth, or other health issues. Chemical hazards are chemicals that get into food like cleaning supplies. This type of hazard can be very dangerous. All of these hazards should be taken seriously since they pose a great health risk. The danger zone is an important concept in food safety, and it is where many food safety rules come from. The danger zone refers to the temperature that allows bacteria to quickly grow in food, making it dangerous to eat. The temperature danger zone is about 40-140 degrees Fahrenheit. Foods that are likely to grow bacteria should be stored in temperatures below 40 degrees. These food include meat, poultry, fish, eggs, dairy, sauces, some opened containers, and any prepared foods like leftovers. 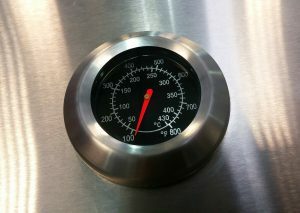 It is important to check the temperature of your refrigerator to make sure it is cool enough. Food should be kept in the danger zone for as little time as possible. This includes when you are reheating or re-cooling food. Keeping food outside of the danger zone does not make it last forever though. Bacteria can still grow in food kept in the refrigerator, and it is important to pay attention to expiration dates and throw out old food. There are a few ways to safely thaw meat. Remove meat from the freezer and let it thaw in the refrigerator. This will keep the temperature of the meat low, which means bacteria won’t be able to quickly grow in it. Many times, meat in the refrigerator takes a whole day to thaw, so it is important to plan ahead. This is a no-fuss method. Can be refrozen without cooking. Chicken, seafood, and poultry last 1-2 additional days in a refrigerator. Meat lasts 3-5 days. Takes more time than other methods, so you must plan ahead. Place the meat in a sealed, airtight package or bag in a bowl and fill the bowl with cold water. Then change out the water at least every 30 minutes, so that it is clean and cold. This is another way to keep the meat cool while it thaws. It is also important that the water is cold, not room temperature or warm. Room temperature and warm water will allow bacteria to grow and can make the meat dangerous to eat later. Depending on how much meat there is, it could take an hour to over 3 hours for the meat to thaw. Once the meat thaws, it needs to be cooked immediately. You must change out water every 30 minutes. Meat must be cooked immediately when it thaws. Meat must be cooked before it is refrozen. Meat can be thawed safely in the microwave. Microwaving may impact the quality of the finished meat. Food must be cooked immediately when it thaws. 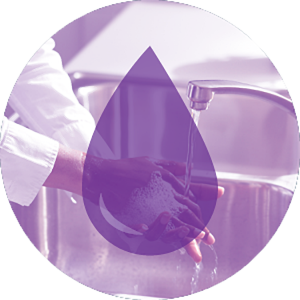 Hand-washing might seem like a simple or unimportant task, but washing your hands must be done correctly to ensure any food you cook it safe to eat. It is also important to wash your hands throughout the day and after doing certain activities, whether or not you are planning on cooking or handling food. Teaching your kids how to wash their hands properly is also important – it can help prevent them from getting themselves or people around them sick. Wet hands with water and turn of the faucet. Apply soap to hands and lather. Be sure to get all areas of your hands, fingers, between fingers, wrists, and under nails. Let your hands air dry or dry them on a clean towel. Have your kids sing “Happy birthday” twice while scrubbing to make sure they have washed for at least 20 seconds. Or have your kids count “one one-thousand, two one-thousand…” up to 20. Get them in the habit early. Training your children to wash their hands right after they use the restroom will get them in the habit of doing so, and it will be less of a chore. Provide a child-safe stepstool so they can reach the sink and wash their hands on their own. Let them pick a soap scent at the store. Letting your kid pick the scent or color of soap might make them more excited about washing their hands later. Make a sign for the bathroom with your child that reminds them to wash their hands. Set a good example by washing your own hands before eating or after using the restroom. What if There is No Running Water? Hand sanitizer can be used if you don’t have access to a sink and soap. Cover hands in the hand sanitizer and rub over hands until dry. Soap and water should be used if available. It is important that left-overs are cooled quickly so bacteria doesn’t grow. Some leftovers, like a large amount of soup or meat, might not cool quickly enough in one piece. A way to make them cool faster is by putting the soup into many small containers or cutting a large piece of meat into many pieces. Cover or wrap leftovers or put them in an airtight container. Leftovers should be refrigerated or frozen immediately after cooking. They can be kept in the refrigerator for 3-4 days or in the freezer for 3-4 months. The same methods of thawing meat apply to thaw leftovers. Refrigerator – This is the easiest method, but requires planning ahead of time. Coldwater – Food in airtight containers can be placed in a bowl of cold water. The water must be changed every 30 minutes. Microwave – This is the fastest method. Microwaving may affect the quality of the food, depending on what the leftovers are. Some leftovers, like casseroles or chili, are easy to reheat without thawing. You can place the frozen leftovers right into the oven or a saucepan and reheat immediately. When reheating leftovers, it is always important to have a thermometer handy so you can be sure they are getting hot enough to eat safely. Leftovers must reach 165 degrees Fahrenheit. Soups, sauces, and other liquids should reach a boil. If there is some food leftover after eating the leftovers, it can be refrozen as long as it reached 165 degrees Fahrenheit when heated up.